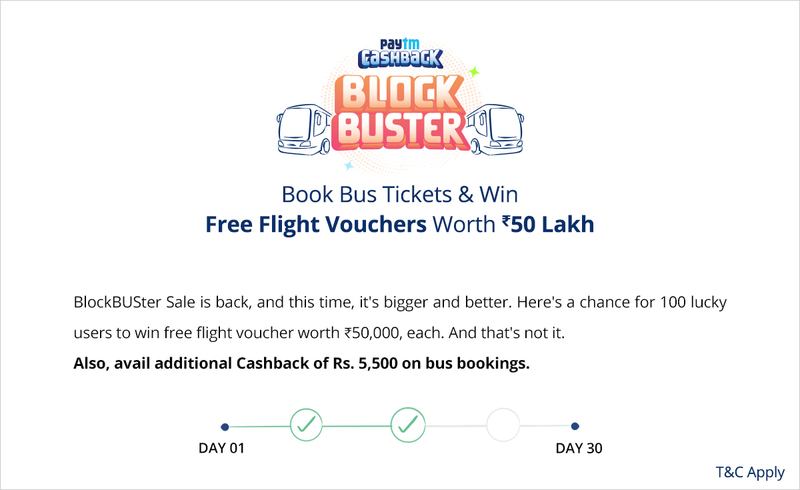 BlockBUSter Cashback Sale - Book 10 bus tickets on Paytm to get vouchers upto ₹5,500. Offer Details: Book 10 bus tickets on Paytm to get vouchers upto ₹5,500. On 1st booking, get upto ₹100 Food Voucher. On 2nd booking, get upto ₹200 Movie Voucher. On 3rd booking, get upto ₹300 Recharge Voucher. On 4th booking, get upto ₹400 Bus Voucher. On 5th booking, get ₹500 OYO Voucher. On 6th booking, get upto ₹600 Hotel Voucher. On 7th booking, get upto ₹700 Electricity Voucher. On 8th booking, get upto ₹800 Backpack Voucher. On 9th booking, get upto ₹900 Fashion Voucher. On the 10th booking, get ₹1,000 Flights Voucher. You can avail this offer once per month during campaigns validity. If you fail to participate in the offer, your offer will be expired. Only one bus ticket booking per day will be counted in the offer. User has to book 3 bus tickets in a month and must have completed all the Bus Journey to be eligible for the free flight tickets Lucky Draw Contest. 100 Lucky winners of the Lucky Draw Contest will be eligible to win flight tickets with a total worth of Rs 50,00,000. Each winner of the Lucky Draw Contest will be eligible to get up to ₹50,000 worth flight tickets. After your first bus ticket booking, this offer will be automatically activated for you. After participating in the offer, you have to book 10 bus tickets on Paytm to get vouchers upto ₹5,500. On your first payment, the offer will be activated for you. You need to complete your bookings within 90 days to get vouchers upto ₹5,500. Each reward will be received within 24 hours of completion of payment. If you have not completed your KYC, or have breached your monthly wallet limit, you will receive Goldback (inclusive of 3% GST). This Offer is sponsored, organized and administered by One97 Communications Limited, a Company having its registered office at 1 st Floor, Devika Tower, Nehru Place, New Delhi - 110019 and corporate office at B-121, Sector 5, NOIDA, Uttar Pradesh – 201301, India (hereinafter referred to as “Paytm”) on its website located at URL ‘www.paytm.com’ and Paytm mobile application, Paytm IVR and Paytm WAP (hereinafter referred to as “Platform” or “Paytm Platform”). By participating in this Offer, You (hereinafter referred to as “Participant(s)” agree to be legally bound by and abide by the Terms & Conditions stated herein (T&C). Participant(s) confirm and acknowledge that Participant(s) has read, understood and agree to conform to these T&C. If Participant(s) does not agree to these T&C, please do not participate in this Offer. Paytm reserves the right to amend, modify, change, add or terminate these T&C or discontinue this Offer without any further notice. This Offer is valid from 2nd April, 2019 at 00:00:01 hours till 31 st May, 2019 at 23:59:59 hours hereinafter referred to as “Offer Period”. The participation in the Offer is open only for the Indian citizens of 18 years of age or above, provided they are Paytm Registered Users in India and have Paytm KYC verified account (as per RBI guidelines) and verified mobile numbers on Paytm. vi. Letter of compliance with rules and regulations and declarations in the format as may be required by the Organizers or applicable laws. * The document list is only indicative and not exhaustive and can change as per the requirements of Law or Paytm to which effect intimation shall be provided. * Pan Card shall be mandatory in all the cases. THE PARTICIPANTS SHALL NOT BE ENTITLED TO PARTICIPATE IN THIS OFFER WHEREVER THE OFFER IS, DECLARED INVALID OR ILLEGAL BY THE COURT OF COMPETENT JURISDICTION OR APPLICABLE LAW, AND THE OFFER SHALL NOT BE APPLICABLE AND /OR STANDS WITHDRAWN FORTHWITH IN SUCH JURISDICTION. Employees of Paytm (including their family members) and of their group companies, affiliate or associate companies, shall not be eligible to participate under this Offer. Where it comes to the knowledge of Paytm that any employee of Paytm or their family members have received or participated in the Offer, Paytm reserves the right to forfeit and or reverse the Cashback.